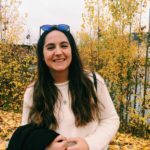 Sofia is a 20 year old Portuguese student of life, stretching herself thin between university in the Netherlands, writing, traveling, sports, and watching Netflix when she really should be working. To compensate for this she makes sure to eat lots of doughnuts. She believes in understanding and interpreting raw thoughts and feelings and following her instinct thoroughly, and would like to encourage you to do the same.